Few gifts can express the romance, love and thoughtfulness behind a sentiment more than an exquisitely-crafted bouquet of roses. As Shakespeare once said, “A rose by any other name would smell as sweet”. 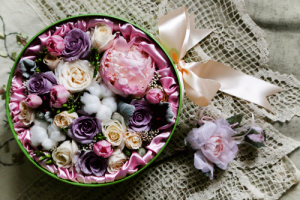 Roses are a wonderful way to show someone you care. And while purchasing the perfect bouquet for your loved one should be easy, many of us often stress over which color to choose. 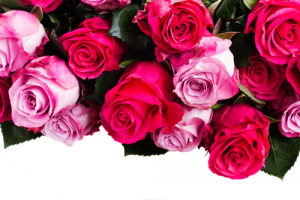 We find ourselves second-guessing and questioning each bouquet we look at. Is red too strong a statement? Does yellow mean friendship or gratitude? Should I go with purple or is that too bold? Selecting the perfect bouquet should be a fun, stress-free experience. While choosing the idyllic color based on meaning is often a popular choice, there are many other options to hand-picking the perfect arrangement for your loved one. - White - Often considered the bridal rose, this color is associated with marriages and new beginnings. It can also be used during times of reverence. - Red - Red is the most romantic of all rose colors. It signifies love, passion and beauty. It can also be used as a celebratory color and as a way to say “Congratulations”. - Pink – Pink is a great choice for times of gratitude and sweetness. It can represent elegance, appreciation and grace. 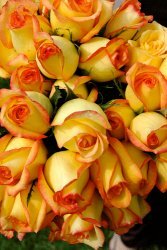 - Yellow – The yellow colored rose is often sent during times of joy, delight and happiness. It signifies friendship and can be used as a way to say thanks, congratulations, or thinking of you. Did you know that each anniversary year not only has a traditional gift but also a color associated with it? For example, yellow is the color for the first anniversary while turquoise is for the fifth. Choosing by anniversary year can be a very sentimental way to select your next bouquet. Dating or engaged? While your anniversary year is typically based on a wedding date it doesn’t have to be. The color could also represent the number of years or months you have been dating or engaged. Are you looking for a creative approach to choosing your next bouquet color? Why not base your selection on your recipient’s birthstone? While you might have to explain the meaning behind the color choice, choosing by birthstone can show your genuine care for a loved one. While gems like ruby (July) and pink tourmaline (October) are easy to match, colors like aquamarine (March) and emerald (May) are a little more tricky. You can tie in these colors by either incorporating an accent floral with those tones into the bouquet or even wrapping the base of a simple white arrangement with beading of the corresponding hue. Always remember that the truly perfect bouquet is one that is purchased with thoughtfulness and care in mind. Whether you decide to go traditional or a little more creative is up to you. The same rules can be applied to your wedding floral choices. At Windermere Elegant Weddings we have experience in assisting our couples in selecting the perfect flowers for their occasion. Contact us today for more information on our custom wedding planning services.